Update 5: Released on $250,000 bail, Roger Stone said Friday as he left court that he will plead not guilty to charges brought against him by special counsel Robert Mueller. The Hill reports that Stone told reporters outside of a federal courthouse in Florida that he will go to trial over the indictment, saying that it is “incorrect” that he made false statements during his testimony before Congress. He also dug in on his previous vow not to testify against Trump. Stone said he will be arraigned on the charges in a Washington, D.C., court next week. Update 4: As Washington reporters sift through the indictment of Roger Stone, confusion about exactly what he is being charged with, as well as the implications for the Trump administration, has already seeped into the coverage. Following Stone’s first court appearance on Friday, his bail was set at $250,000 and his travel limited to Washington DC, Virginia, New York and Florida (Stone can’t leave the country, but his passport wasn’t taken because, according to his lawyers, he has no valid passport). 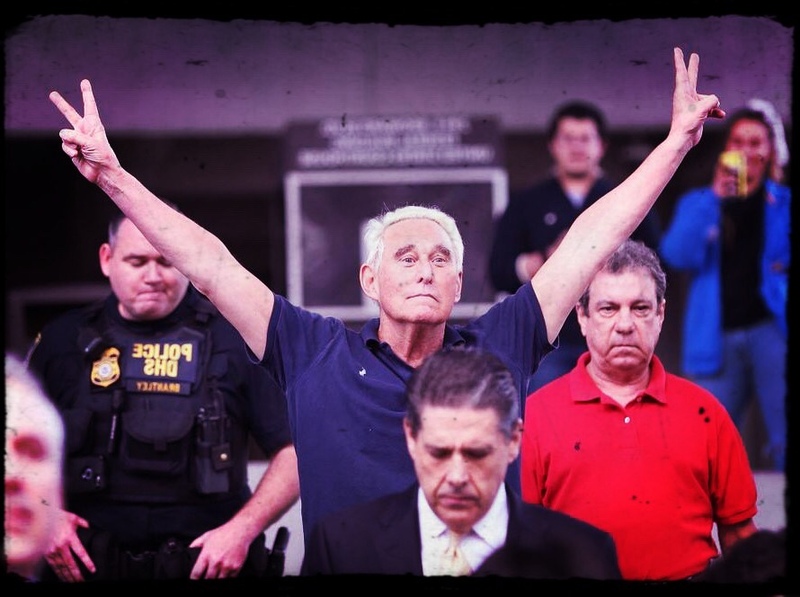 With rulings in the case about to accelerate, the Washington Examiner’s Byron York has published a handy guide to the Stone indictment that aims to set the record straight. Instead of being a broad indictment of collusion between the Trump campaign and Russian-backed agents, the indictment sketches a picture of a man who had been pushed to the periphery of Trump World as the campaign locked up the nomination, who maybe ran his mouth a little too much. But importantly, Stone wasn’t accused of directly coordinating with Wikileaks – indeed he had no advanced knowledge of the contents of the leaks. And he never lied in his interviews with Mueller, either. •	Count One alleges that Stone obstructed the House committee’s investigation by denying he had emails and other documents about WikiLeaks-related contacts. During his House testimony, Stone was asked if he had “emails to anyone concerning the allegations of hacked documents … or any discussions you have had with third parties about [WikiLeaks]?” Stone answered that he did not, when in fact he had a bunch of emails and other communications. The obstruction charge also alleges Stone attempted to prevent Credico from testifying or tried to convince him to testify falsely. Counts two through six concern specific statements to the House committee. Count Two is based on Stone’s assertion that he did not have emails. •	Count Three alleges that Stone lied when he said that Credico was his only “go-between” to Assange, when in fact, Stone was also in contact with Corsi for that purpose. “At no time did Stone identify [Corsi] to [the House] as another individual Stone contacted to serve as a ‘go-between,'” the indictment says. •	Count Seven is a witness tampering charge, alleging that Stone tried to convince Credico to take the Fifth or to lie to the House committee. Notably, the indictment doesn’t allege that Stone had direct contact with Julian Assange (as media reports have suggested) and it doesn’t allege that he had extensive communications with anybody in the Trump Campaign related to Wikileaks. of the Trump Campaign about [WikiLeaks] and its intended future releases." avoid contradicting STONE’s testimony. Frank Pentangeli is a character in the film The Godfather: Part II, [who testifies] not to know critical information that he does in fact know." Originally Published by Tyler Durden at Zero Hedge. Copyright Information: This content has been contributed to America Uncensored by a third-party or has been republished with permission from the author. You are encouraged to click their link above for more interesting content.